Being soft, squishy, warm, and comfy, the K&H Microwavable Pet Bed Warmer is the only one of its kind. It's simple to use, just minutes in the microwave is all it takes. The non-toxic warmer is safe and stays warm for up to 12 hours inside a pet's bed. Simply microwave it as needed for anytime warmth for your pet. Hand wash with soap and water. Durable neoprene cover and a silicone bladder makes for a long-lasting product. Designed for indoor use and will only stay warm up to 8 hours in a climate-controlled indoor environment. Non-toxic and simple to use, just 4-5 minutes in the microwave is all it takes. 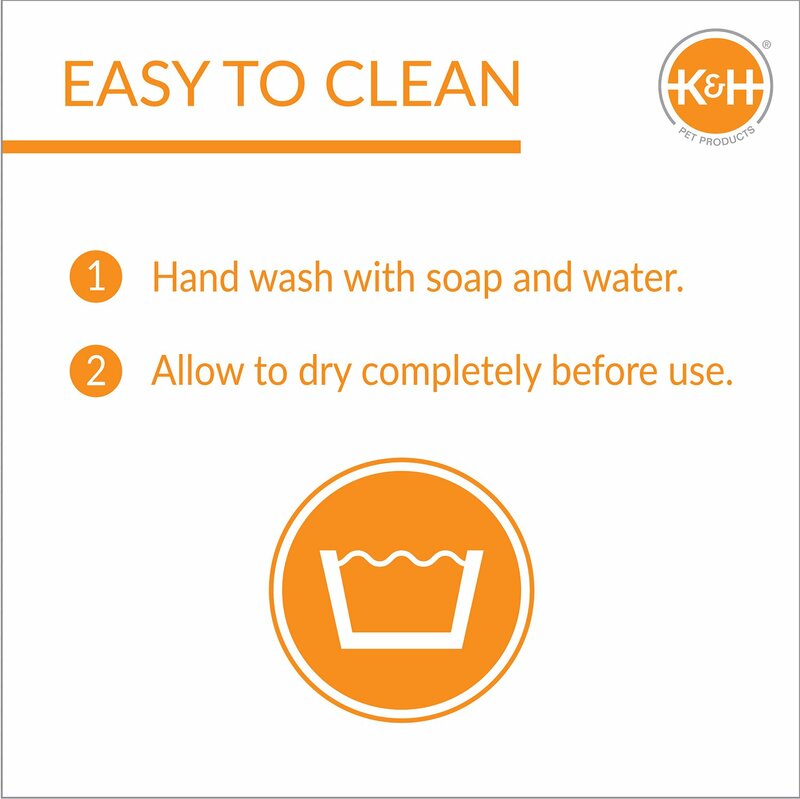 Easy-to-clean, this item should be hand washed in the sink with soapy water and rinsed well, then hung to dry. Consult your veterinarian before use with young puppies/kittens, convalescent pets, during surgery/surgery recovery, or any animal that cannot voluntarily remove themselves from the heated pad. Do not place pad in confined area where the pet does not have the ability to remove themselves from the pad. Always allow your pet enough space to be able choose if they want to rest on the pad or off the pad. For indoor use only. Heat for 4 - 5 minutes in your microwave, until warm and squishy. Insert inside cat or dog bed for up to 12 hours of warmth. Hand wash cover in the sink with soapy water. Then, rinse it well and line dry. 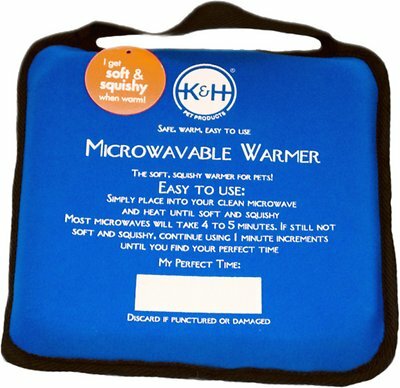 What is the material in the K&H Microwavable Pet Bed Warmer? This product consists of a neoprene exterior and a silicone bladder. Could I use this product outdoors? The Microwavable Pet Bed Warmer is designed for indoor use and will stay warm up to 12 hours in a climate-controlled indoor environment. After heating, all of the inner material is squishy except for an object located at the top inner edge of the warmer. What is that? The hard object is the plug that prevents the inner material from coming out of the top. Is it possible to heat the product too much or too long? I heated it about 5 minutes and I'm not sure if it's going to stay warm long enough. Five minutes isn't too long, but you don’t want to microwave it for too much longer than that. Only microwave the warmer to the point where the contents become a liquid. Nowhere is there mention of overheating the wax inside. Probably because the wax can start to burn & it smells super bad if overheated. I'm now careful to reduce amount of heat time of the second and third heating to just around 30 seconds. This is after the first long warm up. As the wax softens, I take it out and squish it around to help eliminate any hot spots. I must say, however, that the warm time is nowhere near what is promised. In the open, the warmer is cool (and hard!) by the three hour mark. I am still trying to figure out the best way to use it because it is a bit too warm, especially fresh out of the microwave. It heats up easily and stays warm for hours. I have been putting it under my dog's bed- not in the bed, but even that seems to be a bit too warm. We are working out the best use, but I am glad I bought it and would recommend. Works good. 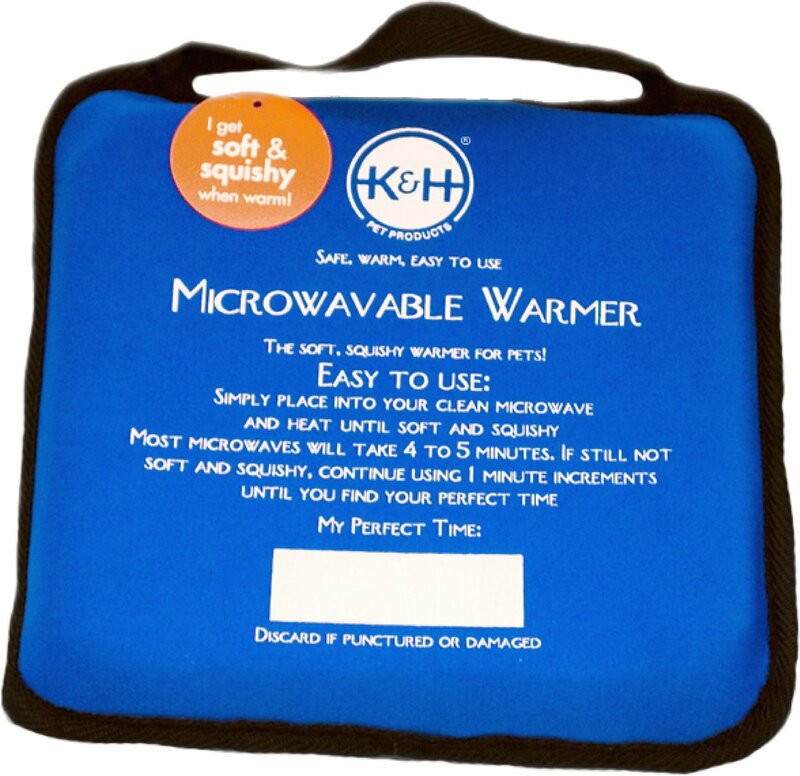 Seemed to stay warm longer when I first got it but quickly got to where it doesn't last as long when you heat it, but still a very good product. Would recommend! This keeps my outdoor kitty warm. She won’t come inside and I was worried about her in the cold but she loves her heated kitty house. Very warm and easy to use. So we are trying to crate train my dog and she is always cold. So we decided to give this a try. She can tell something is under her bed and she sniffs at it and then runs away. But no one could predict she wouldn't like it. It definitely does not stay warm for 12 hrs like it states. It is more like 4 hours. All in all, it's a pretty great idea. Heats up to a nice temperature. Wish it would stay warm even longer. It gets hard as it cools. The neoprene smell is not great. It’s a little large for my microwave, but it stays warm for hours and provides a safe way for my dogs to curl up to warmth. Easy to warm cup in Microwave, stays warm for some time. I use these for my foster kittens. I have these and the snuggle safe circular disks. I feel like these are warmer and last a decent amount of time. I microwave them before putting everyone to bed, and 8 hours later they are still warm. I also like how these are softer and are flexible. I wrap them in a blanket and put them in a small box for the kittens to lay on.